This Irish baby onesie is only available in size 0 - 3 months. This Irish Christening outfit is a onesie that features a Celtic cross. The Irish baby onesie has reinforced snap closure at the bottom for easy dressing and diapering along with double-needle ribbed binding on neck, shoulders, sleeves and leg opening. 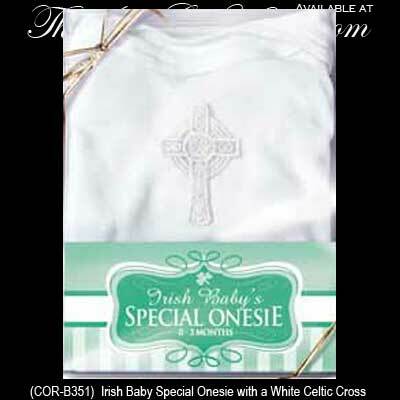 The Irish Christening onesie is gift boxed with a Celtic cross history card, complements of The Irish Gift House.